there are so many negative connotations linked with this model. C.W.U. has reassured staff members and offered them C.W.U. 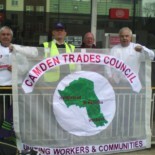 This entry was posted on October 30, 2013 by CAMDEN TRADES COUNCIL.